Not your typical Turkey Trot. This 5K & 10K holiday run has a mixture of dirt and paved trails. You are going to feel like a pilgrim at the stream crossing and run through the woods. This run has great mountain and lake views. Come out and burn those holiday calories off. Take a break from your Christmas shopping and run Bonelli Park for a fun filled holiday run, you won't be sorry you did. Famous San Dimas Turkey Trot pint glasses will be awarded to the top 3 male/female finishers in each age group. All participants and kids will get a finishers medal for their trot. Don't forget the kids! 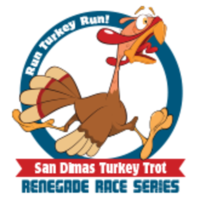 The San Dimas Turkey Trot is fun for the whole family! Come run the 5K or 10K and stay for the kids run. 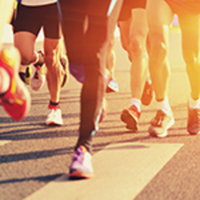 Keep your kids in the action and promote physical fitness with this 1/2 mile run. All kids will get a commerative finishers medal. Special awards to the best costume. Come run as a pilgrim, turkey, or indian, you pick. If you haven't run in costume before believe us when we say it will pump up your fun factor 100%. Don't do it alone, bring all your friends out and run in costume, it's fun for your whole family. Bonelli Park in San Dimas is easy to get to. Find maps and directions at www.renegaderaceseries.com. Exit Via Verde from CA-57 and follow the signs to Bonelli Park (120 Via Verde Park Road, San Dimas, CA 91773). Enter through the park gate on Via Verde (South Side) and take either your 1st or 2nd left for event parking. Bonelli Park charges an $10 parking fee upon entering so carpool when possible and have your $10 ready. Looking for something more adventurous? Come out for the Turkey Tri. This 1/2 Mile Swim, 14 Mile Bike and 4.5 Mile Run is perfect for both seasoned and new triathletes. We have a kids Triathlon too. Find out more about the Turkey Tri by clicking Here! Age divisions are based on a participants age on race day. Age groups are <11, 12-14, 15-17, 18-19 and then in 5 year age groups starting at 20-24 and going through 85+. Trot is open to ages 8 and older only. Kids Trot recommended for kids 7 and under.